Oregon’s Wild and Scenic Metolius River is one of the most magical places I’ve ever experienced. The Metolius is located in the Deschutes National Forest, not for from the City of Sisters, Oregon. The Metolius River dramatically springs out of the ground at the base of Black Butte, a symmetrical 6,436 foot tall stratovolcano. The Head of the Metolius is developed with parking lots bathrooms and well marked trails to the springs that burble out for the ground at the northern flank of Black Butte. The drainage basin of Black Butte Ranch a few miles south feed the springs which emerge from Black Butte. 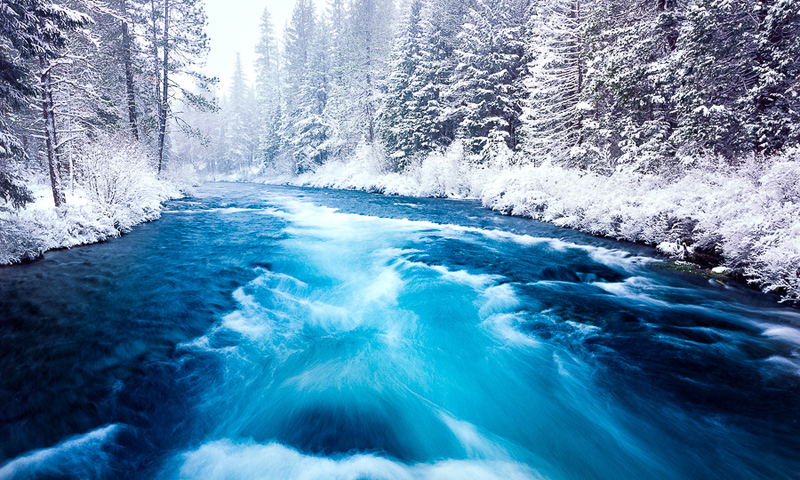 As the Metolius flows northward, away from Black Butte, it is joined by several prominent tributaries such as Lake Creek, Jack Creek and Canyon Creek. As the Metolius continues northward, it passes through community of Camp Sherman which is anchored by the charming Camp Sherman Store. The Store has basic provisions, a fly fishing shop, a broad selection of drinks, magical deli sandwiches, and some of the most wonderful beverage coolers you will ever see. 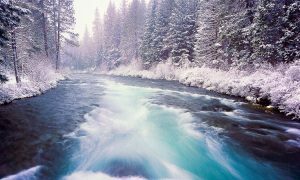 They also happen to carry my line of Oregon Greeting Cards as and they currently display my fine art photograph of the Metolius River which is at the top of this page! When visiting Camp Sherman, the store is a must visit. I highly recommend you stop in, grab a beer, order a deli sandwich and spend some time by the river. It is a magical experience. As the Metolius continues north, it passes several beautiful campgrounds such as Allingham, Smiling River, Pine Rest, Gorge and Canyon Creek before it passes the Wizard Falls Fish Hatchery. Wizard Falls, is more a a rapid than it is a waterfall but the bridge to the Wizard Falls Fish Hatchery is an excellent location to view the turquoise waters of the Metolius River. The Wizard Falls Fish hatchery is an excellent side trip for families. It is set amongst old growth Ponderosa Pines, Douglas Firs and Cedar trees and the classic forest service style buildings add to the nostalgic feel. Feeding the huge Rainbow trout that reside in the tailing pond is a big hit with children and adults alike. Many of the Chinook salmon hatchlings that are helping to re-populate the Metolius with anadromous fish are raised at the Wizard Falls Fish Hatchery. With all of its beauty and elegance, the Metolius is a difficult River to appropriately honor via photographs. My goal as a fine art photographer is to capture as much of the essence of the special places that re-fuel my soul. The Metolius Basin is clearly special. 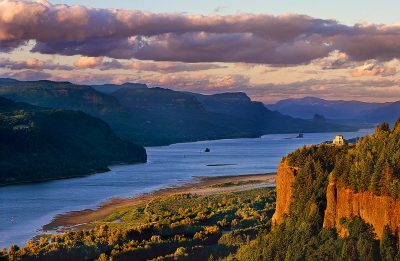 Turquoise waters, old-growth pines, wildlife, world class fly-fishing hiking trails, and epic fall color are only part of it’s allure. I’ve spent hundreds of hours “scouting” the banks of the Metolius River. In those hours, this is by far the most beautiful composition I’ve found. The day I found this perspective, I was ecstatic. It was autumn and I knew that the wonderful vine maple stretching out over the Metolius would improve their autumn color in the days to follow, so I returned for four successive days. Conditions would never cooperate. As I was perched on a mossy bank, overhanging the river, the shooting was precarious, the exposures were frustratingly long and I was distraught. Wind, heavy rain and eventually, the end of autumn forced me return to this exact location. 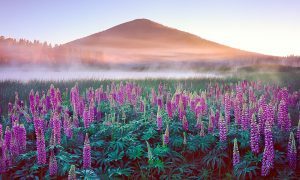 The next year, I was rewarded with the beautiful fine art photograph of the Metolius River you see at the top of this page. 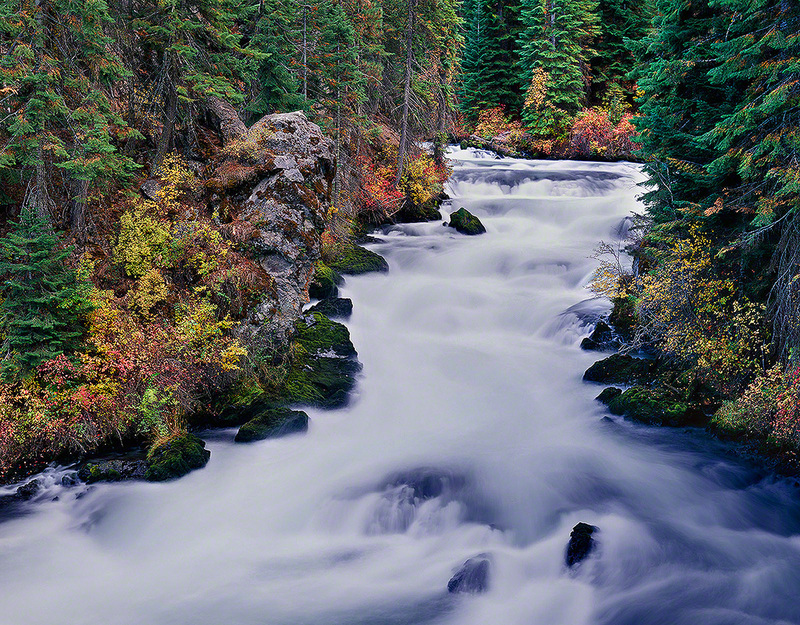 I am thrilled with the results, a fine art print that honors the beauty of this magical river. 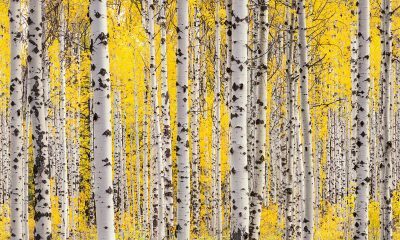 The finished print of this gorge image are stunning. 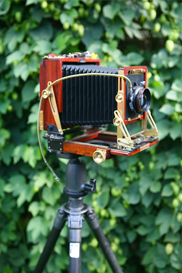 Impeccable detail captured by my large format 4×5 film camera make stunning photographs to over 50 inches tall. 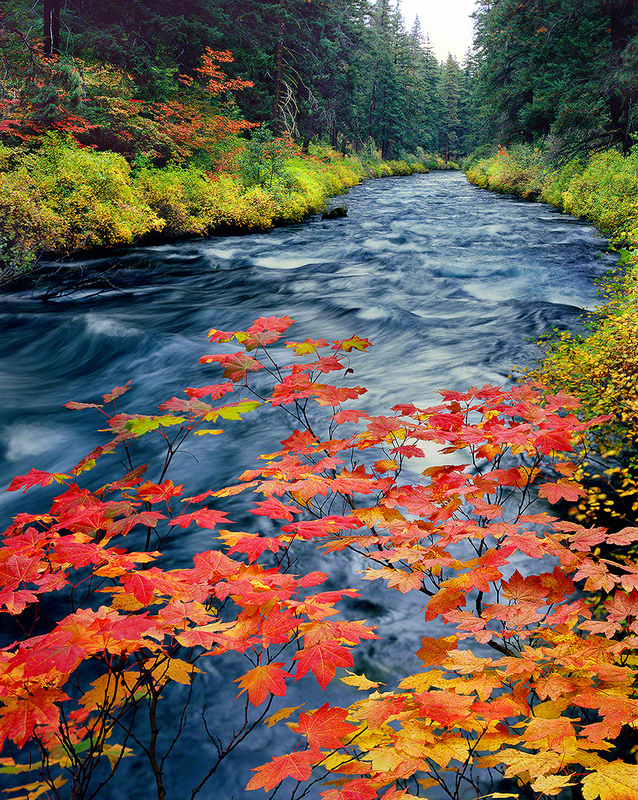 The feel of the vine maple branch in full autumn regalia hovering over the rushing waters of the Metolius is mesmerizing!